Modeling is essential in the design of genetic circuits with desired properties. I will review several examples where mathematical models have been central to the development and understanding of the dynamic of synthetic organisms. I will focus on synthetic bacterial microconsortia that exhibits emergent oscillatory behavior – when co-cultured, the interaction between two bacterial strains results in population-level transcriptional oscillations. The spatio-temporal dynamics of such consortia, including synchrony between distant parts of the population, depend sensitively on the architecture of the underlying genetic circuits. 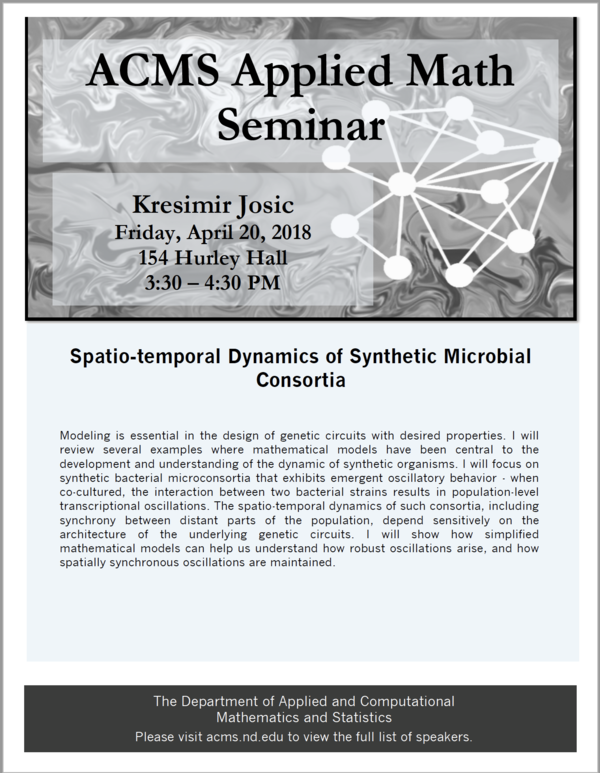 I will show how simplified mathematical models can help us understand how robust oscillations arise, and how spatially synchronous oscillations are maintained.